In two short years, music-turned-fitness entrepreneur Jennifer Bandier has emerged as one of the buzziest retailers in the biz. At her home in Southampton, she explains! When did you start coming to the Hamptons? My parents first rented a house in Sagaponack in the ’60s, and ever since then, we’ve had a house out here. My parents are now divorced—my mom lives in East Hampton, and my dad and stepmom live in Southampton. There are two houses on their property, so my husband, Neil, and I live next to them. How did you get into retail? I broke my foot a few years ago and could only wear stretchy clothing over my cast. When I got back into working out, I wasn’t satisfied with what I could get in New York, so I was buying a lot online. People would ask, “Where did you get that? I love it!” So I turned to my husband one day and said, “I really think I should open a multibrand activewear store.” That night, I decided to open my first one in the Hamptons. Five stores [in the U.S.] and e-commerce, which really acts like another store. We’ll probably open two more this year in California. When I’m out here, every day. A couple weeks ago I stayed in my pajamas all day because I had been at work the day before. It gives me the direct connection to the customer, and I feel like I can get their feedback. Well, I used to be a lot more athletic, but I had surgery on my knee around a month ago. I love dance cardio. When I’m in the Hamptons I’ll go spinning at Flywheel or SoulCycle or take a class at SLT. But mostly, I run outside. It’s so beautiful, especially the lighting in the morning. You make it fun with the clothes and the music. My dad worked for Sony for a while, and before that, he was at EMI, so I grew up around music. I worked in the marketing department of a London-based record company called HMV for many years, and then I worked with the band TLC in management with my ex-husband. He still does that, but it’s a hard life. Yeah—being on the road and in the studio nonstop. I lived in Atlanta for a while and was sort of all over the place. I wanted to try something new and launched a customized pet product on QVC. They were pet beds and bags that you could put photos in. What are your songs of the summer? Do you keep in touch with the artists? Yes, I still speak to Tionne [Watkins]. She sent me a picture of one of my dogs for Mother’s Day. Why did you tap Cushnie et Ochs for a collaboration? 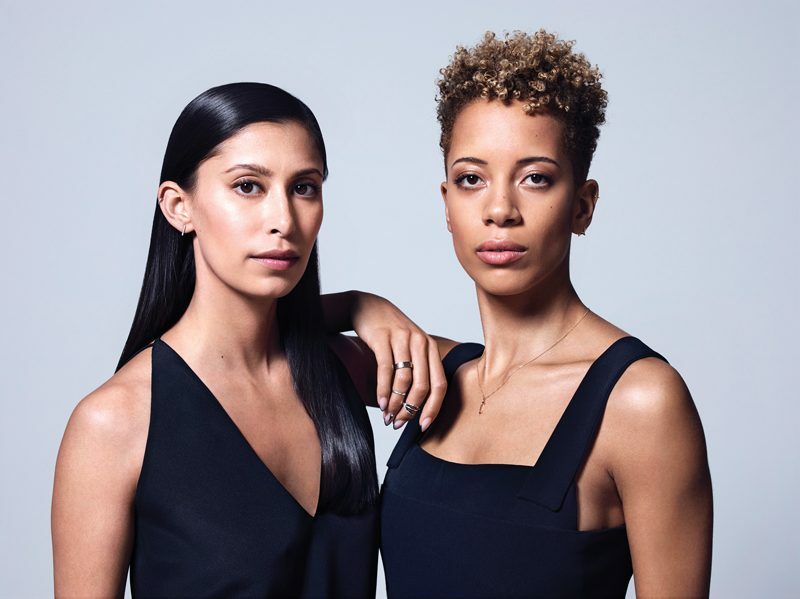 Both Carly [Cushnie] and Michelle [Ochs] lead such active lives; this is really an extension of their line, which is why it’s been so successful. How many pairs of leggings do you own? What sparked this collaboration with Bandier? Michelle Ochs: Bandier is a one-stop-shop for all the best in athleisure and activewear. It has such a fantastic curation and really brings together the best in fitness, fashion, and music. Was this your first time designing athletic-wear? Carly Cushnie: Yes! We felt that this was really the right time for us to offer a new category for our customer. Michelle: We really wanted to create the little black dress version of activewear—essential pieces that highlighted the body that a wearer could easily mix and match. Our muse has always been the body, so the peaks of skin, the lines, and the cuts were the key details in the collection. What are your favorite workouts these days? Michelle: I’ve recently discovered Pilates, and I really love it. Carly: I love to mix it up, from a spin class to dance cardio and yoga, but my favorite is SLT. Carly, congrats on your engagement! Carly: Thank you! It was an incredibly emotional and magical moment that I will never forget. When it happened, I had come straight off a red-eye flight and was dressed in yoga pants. Any travel plans this summer? both our honeymoon and one-year anniversary, actually. We’re heading to Tanzania for two weeks. I can’t wait! Carly: I will be doing some wedding recon in Mexico, but otherwise, staying local. Click HERE to read the full issue of the Daily Summer.